Your nails are an amazing indicator of your health. In traditional Chinese medicine, doctors have used the eyes, tongue, skin, nails and similar things to determine if someone is healthy or ill and what is wrong with them. Modern medicine has realized that many of these indicators are effective ways to diagnose a problem. Horizontal ridges in nails can indicate a vitamin or mineral deficiency. They may also indicate a serious health problem or a more minor illness. Horizontal ridges in nails are also known as Beau’s lines. These ridges are often an indication of some type of problem or medical condition. The way they show up and how they look can indicate which type of medical condition you are experiencing. If you have had a surgery, it could lead to Beau’s lines. Some surgeries can cut off or limit the amount of oxygen that you receive, so this can cause the ridges to appear. Diseases that affect the heart, liver, thyroid, skin or kidneys can also cause horizontal ridges to develop on your nails. In addition, certain types of skin cancer can make this happen. Melanomas can cause darkened cuticles as well as nail ridges. These aggressive cancers must be treated right away to prevent them from becoming a problem. There are some injuries that can end up causing horizontal lines. If you crush your hand in a door or accidentally hit your nail with a hammer, this can cause the lines to develop. Runners sometimes get horizontal lines on their toe nails because of the ways their shoes rub against their toe nails. Certain chemicals like nail polish may cause the nails to become brittle, peel and develop horizontal lines if you have been exposed to the chemical for long enough. Biting your nails may also cause horizontal lines to appear. Most people are not going to be poisoned, so this is one of the least likely causes. An overdose of silver, chemotherapy and arsenic poisoning can all cause ridges to develop on your nails. 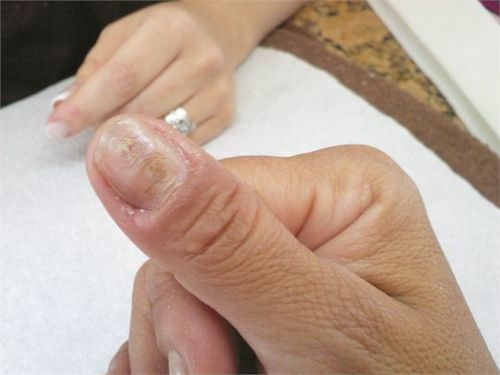 Yeast, fungal and bacterial infections can end up causing horizontal ridges on your nails. Viral warts and heart valve infections can also affect the way your nail appears and can occasionally cause horizontal ridges to develop. Can Horizontal Ridges in Nails Be a Sign of a Serious Problem? Your first goal is to figure out the cause of the horizontal ridges. The only way for your ridges to go away and stay away is to treat the underlying medical condition. Once that condition is gone, your ridges should also gradually go away over the next few weeks or months. If you want to just keep your nails looking good, you can use the following steps. The foods you eat have an immediate impact on your health and how your body looks. Lemon juice, bitter lettuces and apple cider vinegar can be consumed to help your body absorb minerals properly. Slipper elm powder can also be consumed before you eat to make sure that your body gets the right minerals. Herbs like gotu kola and horsetail can improve your nail health. Likewise, green leafy vegetables and fruits will ensure that your nails get the vitamins that they need. You should also make sure that you get plenty of protein and fatty acids in your diet. Essential fatty acids can come from sources like fish oil, nuts and avocados. Your protein can come from fish, chicken, nuts and tofu. If you want your nails to look great, you have to take care of them properly. Use a cotton ball and nail polish remover to remove any nail polish. Then, wash your hands and dry them. Use a little nail oil or cuticle cream on each nail. This helps to prevent peeling, hangnails and cracking. Buff your nail in an X-pattern from the corner of your nail to the middle. Only do four to six strokes per nail so that you do not overdo it. In addition, you should redo this entire process each week to help your nails stay healthy. If you do not like the look of the ridges, you can use a ridge filler to hide them. Nail massage can help stimulate blood flow to your nails so that they look their best. Use jojoba oil, vitamin E lotions or coconut oil for the best effect. These moisturizing lotions will also help your skin and hands look healthy naturally. Each night, massage your nails before you go to bed on the fingertips to your palm to help stimulate blood circulation. Previous articleWhen Does the Placenta Take Over?